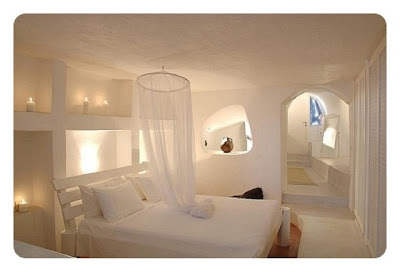 "inspired - beautiful WHITE bedroom". then it is my bedroom. and everything a bedroom should be. It's my favourite room in the whole house. and am always looking for ways to improve things. that I have bed on the brain. 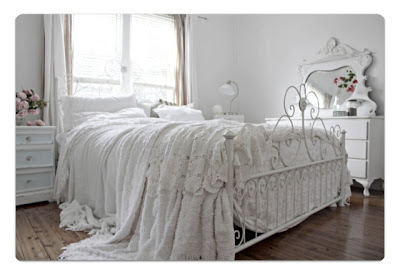 But today I'm going to share some beautiful bedroom inspiration. and I fear that a canopy might be too much. where the light isn't directly above our bed. and this one feels a bit like a cave. that I would like to crawl into that bed for a little sleep. with an abundance of oversize blankets. but I might just need a few more....! This is my dream bedroom. White - check. Clapboards - check. Balcony - check. Sea view - check. The space above our bed is a bit empty at present. but in the space above I want to do something similar to this. I'm currently collecting different shapes and sizes of hearts to hang up there. I can't wait until I have enough to hang them. So that's my inspiration this week. Can't wait to see what has inspired you. (Picture One is my own. Pictures Two, Three, Five and Six were found via Pinterest. Picture Four is from A Beach Cottage. 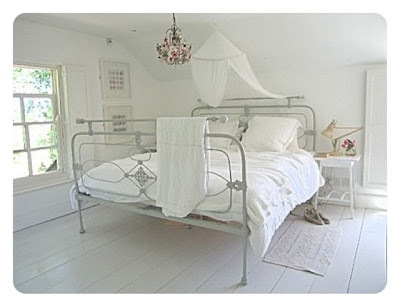 I've just started writing my Inspired post and it's also on bedrooms! I wish Dean would let us have a white bedroom but he likes a bit of colour. The one with all the blankets is making me feel all sleepy... I want to climb into it right now! If only I could make my bedroom look as pretty as yours! Am very jealous!